Saxophonist/composer/bandleader David S. Ware began playing saxophone at age 9, and his innate talents were recognized and nurtured by astute teachers at his NJ public schools. By age 12 he knew that he wanted to become a professional jazz artist. 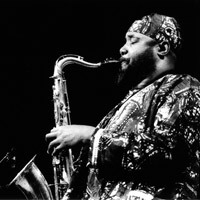 While still a teenager, he began a mentor/musical relationship with saxophone colossus Sonny Rollins, who taught him circular breathing in 1966. Following David’s arrival in the NYC loft jazz scene of the early 70s, word of his potent voice on tenor sax spread quickly. He soon became a member of the Cecil Taylor Unit, with whom he toured throughout Europe, the U.S. and Canada. 2009 was a profoundly transitional year in David S. Ware’s life. It was his 50th year of playing saxophone, and, after nearly a decade of peritoneal dialysis, it became evident that a kidney transplant was the only path to his continued survival on this Earthly plane. A donor (Laura Mehr) was found and the transplant took place in May. In October, David performed a triumphant-return solo concert in NYC; the recording of which was released as Saturnian David’s planned special recording project to celebrate his 50th year of saxophone took place in December, resulting in the impeccable Onecept, which was released in October 2010. In November 2010, David entered the studio with Cooper-Moore, William Parker and Muhammad Ali to record a summit meeting of eternal musical masters. The resulting album, Planetary Unknown was released in June 2011. This group’s concert debut took place on June 10 at the Vision Festival in NYC; their EU debut took place on August 27 at the Saalfelden Jazz Festival. There will be a new Planetary Unknown album in 2012. Organica, David’s second volume in a planned series of solo recordings, will be released in October 2011.